So just how much can you fit onto a micro-ATX motherboard? 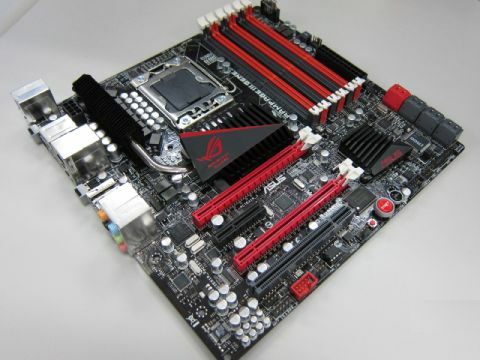 If, in some perverted alternate reality, Watty Piper had been more interested in PCs than trains, ASUS' latest piece of Republic of Gamers rolling stock, the Rampage III Gene would be the The Little Board That Could. The Rampage III Gene has more features per square inch of PCB than almost any other we can think of, nearly matching its stablemate, the Rampage III Extreme, for extras, put packing it into a micro-ATX format. Of course, there's an argument that says if you're the kind of person who wants to cram a high end Core i7 CPU into a small form factor case suitable for LAN gaming, and then try to overclock the hell out of it, then your reality must be slightly skewed anyway. Stick a Core i7 980X in – and we did – and you have six core/16 thread performance in a shoe box case. Madness. If that's your thing, though, you're well catered for. The Rampage III Gene goes up against the similarly small and well-specced likes of MSI's X58M and DFI's LANParty JR X58-T3H6. To differentiate itself, it comes armed with USB 3.0, 6Gbps SATA and some clever on-board proprietary technology for maximising the Turbo features of a Core i7 chip. The problem is that it's also the most expensive of the bunch. MSI's X58M can be had for less than half the price, so here's the question: is the Rampage III Gene twice as good?